Dorsett had a brilliant college career, receiving All-American recognition in all four years and culminating in Pitt winning a national championship and the star running back winning the 1976 Heisman Trophy. 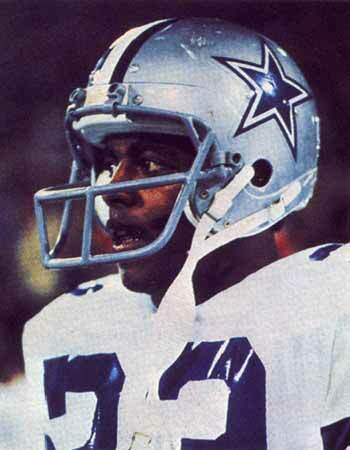 The Cowboys traded for Seattle’s second overall pick in the first round of the ’77 NFL draft to get Dorsett. He spent most of his rookie season backing up HB Preston Pearson until being inserted into the starting lineup for the last four games. Cowboys went 12-2 to finish first in the NFC East with the conference’s best record while leading the NFL in total yards (4812) and touchdowns (42, tied with Oakland). Won NFC Divisional playoff over Chicago Bears (37-7), NFC Championship over Minnesota Vikings (23-6), and Super Bowl over Denver Broncos (27-10). The 1000-yard rushing season as a rookie proved to be the first of eight in his initial nine years with the Cowboys (missing out only during the strike-shortened 1982 campaign). He had a career-high of 1646 rushing yards in 1981, when he was a consensus All-NFL selection, and he received at least some All-NFL or All-NFC recognition five times and was selected to the Pro Bowl on four occasions. His career highs for pass receiving were 51 catches for 459 yards in 1984. Dorsett was with the Cowboys for 11 seasons, eventually splitting time with Herschel Walker, and finished his career in 1988 with the Denver Broncos. At the time of his retirement, Dorsett’s 12,739 rushing yards ranked second all-time. He also caught 398 passes for another 3554 yards and scored a total of 91 TDs. In 17 postseason games, he rushed for 1383 yards. Dorsett was inducted into the Pro Football Hall of Fame, Class of 1994.